Several months ago, I bought some Johnston & Murphy shoes at an outlet store while I was on vacation. I was working in my first real “big boy” job at a major financial institution, and needed some new shoes that were worthy of my new surroundings and pay grade. While I was making more money, I had only gotten a few pay checks, so I was still looking for a deal. I really liked these shoes when I tried them on, and decided to buy them, one in black and one in brown. Between the two pairs, I’d worn them 6 days a week for about 6 months. They were pretty much the most comfortable shoes I’d owned up to this point, which was great because I was in them for 8 – 10 hours a day. About 6 months in, I noticed that the left shoe in my brown pair started developing a slight squeak whenever I put weight on it. The sound got way louder when the shoes were wet. “Oh no, I paid $100 + for shoes that would only last me 6 months?” I was a little disappointed, but I still liked the way the shoes felt and looked… I guess I would just have to stay out of puddles. Several weeks later my wife and I were in a local mall back home, and saw a Johnston & Murphy store. We decided to go in to see if they had another pair like the one I loved with the squeak. I walked up to the counter and told the salesperson what the issue was, and why I was wanting to replace the shoe. He politely asked me to sit in one of the chairs while he went to the back to see if he had any of that particular style in stock. After a few minutes, he walked back with a pair in hand. He laced them up, and put the shoes on for me. My wife looked at me like “what great service…” and I nodded back. I walked around and sure enough, they felt just like the pair I had. My wife and I were stunned! We couldn’t believe the service, and the gesture. Johnston & Murphy has found a customer for life in me. I will always buy my shoes from the Johnston & Murphy’s at the Chesterfield mall in St. Louis…. as long as I live in St. Louis anyway. Great products, and great service. Thank you very much. In the comment section below, please fill in a quote, followed by the name of the person who said it, and finally, if the quote is from a movie, tv show, book, or anything else that is attributable to a public or private work, please cite it. This is a very simple, yet extremely addictive game. The basic idea is to build a tower as large as you can get it. There are no limitations on the size, or the number of floors you can have. There are two basic floor types, commercial floor (coin generating) and residential (employee generating). Each residential floor can have up to a max of 5 residents. These residents are given jobs to do on your commercial floors. Commercial floors can have a maximum of 3 employees, but can be run with as few as 1 employee. Commercial floors belong to one of five types of commerce; Food, Service, Recreation, Restaurante an Creative. Each of these types is given a color for ease of identification. Each commercial shop/store has a unique name, again so you can find a specific one (more on that later). Residents/Employees all have a skill level 0 – 9 for each of the 5 commercial floor types. In addition, each resident/employee has a dream job they would like to one day have. Placing an employee in a shop where their skill level is 4 or less, will result in an unhappy employee, placing them in a shop where their skill is 5 or above will yield an indifferent employee, but the higher the skill the more money you will save when restocking the floorwith merchandise. If you place a resident in their dream job, they will give you 2x the normal stock for the price of one. From time to time, you will have the ability to fairy people from the main lobby, on the ground floor to one of the floors in your tower that the person requests. Doing so will give you coins (coin value is 2x the floor number they requested, so floor 14 will pay you 28 coins). Occasionally, a rider will tip you a tower bux for the ride. Randomly, you will be asked to find a specific person in the tower, this will always yield you a tower bux, so I highly recommend you complete these. hours off the construction time of a new floor), Celebrity (will temporarily increase the traffic to a commercial floor), Real Estate Agent (will move residents into any/all available spots in a residential floor), Big Spender (will buy out all of a single item on a commercial floor). Delivery Person (will take 3 hours off any restocking on a floor). 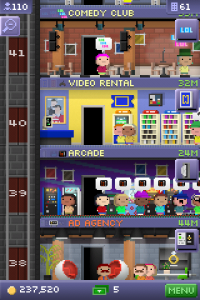 It’s it a very good idea to get all your floor types in one area for when you need to search for your Bitizens… To go along with this, you should also change the shirt color of your employees to match their floor business type. This way if you need to find someone of the food type. Their little search picture will show you that they are wearing a green shirt…. You can then go to the section of your tower that has your green type businesses…. If you’re building everything evenly, then on a 100 floor tower, you should only really need to search 10 or so floors to find the person you’re looking for…. Occasionally your bitizen will be on an apartment floor, but these are rare and pretty easy to search through. If you’re looking to make tower bux easily, you should plan on trying to play for a stretch at a time. 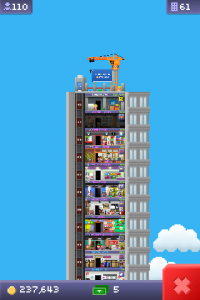 You should get a number of elevator requests to take bitizens to floors, and if you’re lucky these bitizens will tip you. Also, you should have a number of requests to search for people… using the technique above you should be able to knock out about 40 – 60 bux per hour. If you’re looking to make coins, and only check in to your tower from time to time (once or twice a day). Fill all your businesses with 3 employees and concentrate on stocking the 3 coin items first, followed by the 2 coin items… This way you can get the best return on your time. If you have max number of bitizens in their dream job on the floor, they will give you x2 the number of normal stock for the same price! More often than not, it’s NOT worth upgrading the stock capacity of a floor for the 3 bux.